The Packard Hawk was a variation of the Studebaker Golden Hawk that was produced only in 1958. With a different front end, hood, and deck lid, the Packard version was luxuriously trimmed with a leather interior. Power was from the same supercharged 289 cubic inch Studebaker V8 engine that powered the Golden Hawk. Only 588 Packard Hawks were produced, so it is a rare bird indeed. This fine example belongs to Tom Healy of Newburyport, Massachusetts. 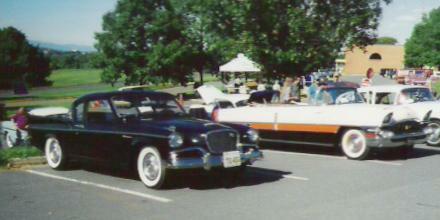 This picture of a 1956 Packard Caribbean Convertible parked next to my 1957 Studebaker Silver Hawk was taken at a car show at Piedmont Virginia Community College. 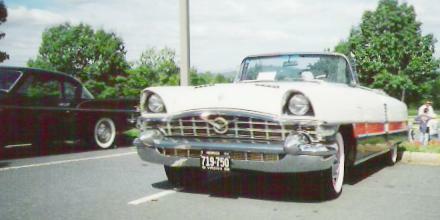 The 1956 Packard Caribbean Convertible is even rarer than the 1958 Packard Hawk as only 276 were produced. The Caribbean was powered by a 374 cubic inch V8 rated at 310 horsepower. This was the last year for the "real" Packard in that production was shifted from Detroit to South Bend for the 1957 model year. 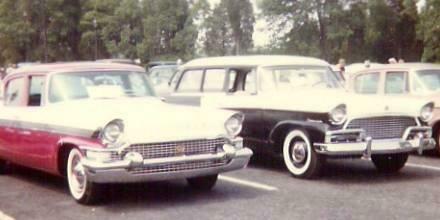 This picture of a 1957 Packard Clipper parked next to a 1956 Studebaker Station Wagon shows the family resemblance of the Clipper to both the 1956 Packard and the Studebaker body on which the 1957 Clipper was based. 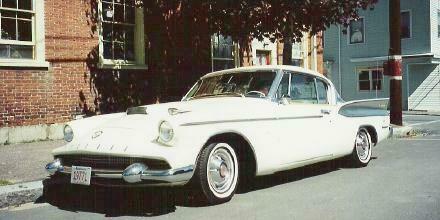 As with the 1958 Packard Hawk, the 1957 Clipper was powered by the supercharged Studebaker V8 used in the Golden Hawk. This was an interesting reversal in that the 1956 Studebaker Golden Hawk used the 352 cubic inch 1956 Packard Clipper V8 also rated at 275 horsepower. The 1957 Packard Clipper was basically a Studebaker President with Packard trim and a very nice Packard style dashboard.